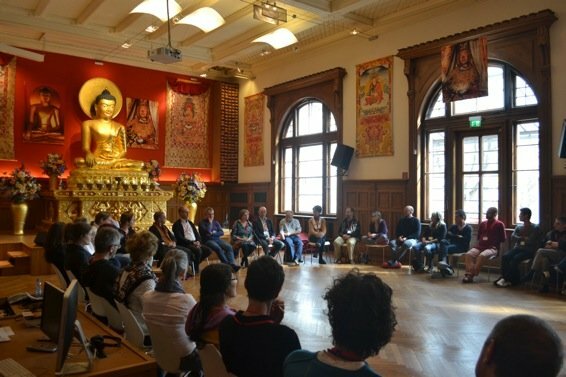 “Over the first weekend of April, I attended the European Buddhist Union’s (EBU) conference “Buddhism in Action” in Berlin. I saw many connections with our annual Buddhist Action Month (BAM) in the UK, and just how important Buddhist social action is. Here are just two responses to the weekend. Over 100 Buddhists from many different countries and communities across Europe gathered together. Many bridges were built and friendships made, listening and talking about such subjects such as ‘Friendship as the future of Buddhism’ , ‘The Importance of action for peace’ , ‘Buddha activity in the city’ and ‘Every day is a good day: A Chan perspective on practice in daily life’. Please go to the BAM 2016 Facebook page to register your interest or to publicise an event. We’d love to hear from you! This entry was posted in Events, News and tagged Buddhism in Action, European Buddhist Union. Bookmark the permalink.